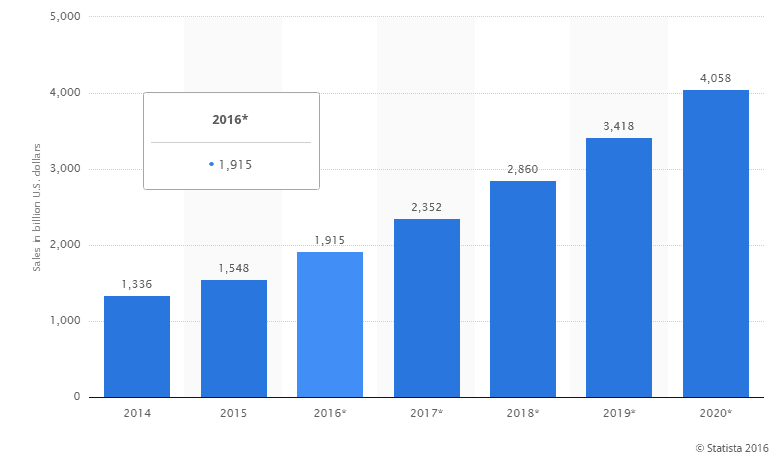 The eCommerce sites are definitely exploded in recent years, so much that the market of online sales in the world involves millions of customers. Years ago when launched, this business had many problems as users of the internet could not trust to purchase online, but today the situation has changed dramatically and shopping on the net has become a great business, as well as a tool to combat the crisis. Lets’s take a look at an important strategy (and related rules) you can consider to increasing the sales of your eCommerce. As you have seen from the statistics above, there are millions of people who are looking to purchase something online. But since there’s so much competition, the most important point you need to understand is what are your users need in order to give them what they want. Inside an online shop, there is no face-to-face contact, so being able to analyse and identify the factors that influence the customers is vital. If you think about it, today users have new demands, thanks to the Internet medium. Therefore, it’s important to satisfy their demands if you want to increase your sales and retain your customers. environment, which is the internet. The importance of product recommendation inside an eCommerce will strongly influence the increase of your sales. Are you familiar with the concept of association rules? Association rule learning is a method to find out connections between variables in large databases. This principle is used both in supermarkets and in online stores. you can extract a rule based on which people who buy diapers are likely to buy beers too. Recommending relevant products to your users based on their specific queries will help you increase your eCommerce sales. 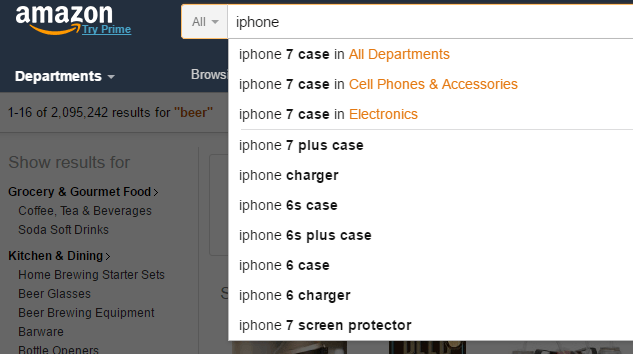 I receive suggestions for beer related items inside specific categories. It’s likely I want to buy also a charger or a case. This way, Amazon increase the chances to make more sales with a single query. The problem is that most of the times the users don’t know what product they are looking for. With a website offering a huge list of several products from different categories, such as electronics, clothes, or books, it’s important to find out what the customer is searching for. 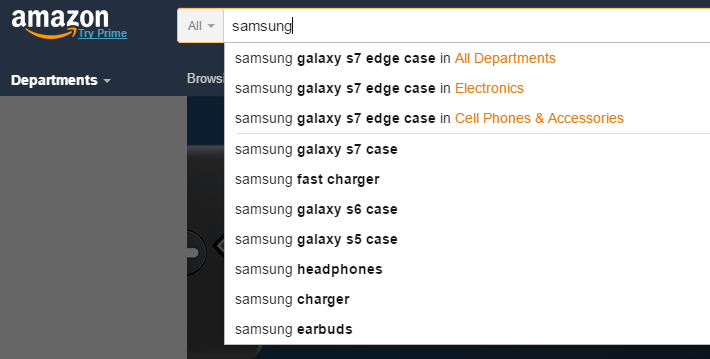 If a user is searching for a keyword like Samsung, the query can be applied to categories like mobiles, electronics, or computers, that include products with that brand. Here a functional eCommerce should be able to identify the input to increasing the relevance and precision of the search results. How to Apply These Principles to Your eCommerce? Sigmarules.com offers an easy and fast way to harness your market basket data in your eCommerce systems by delivering high-quality recommendations to your customers. If you have a sales data with historical transactions, you can use it to discover interesting patterns by analyzing it with specific algorithms. You simply need to feed the engine with your historical market basket data and use the results via a clear and simple JSON based API. 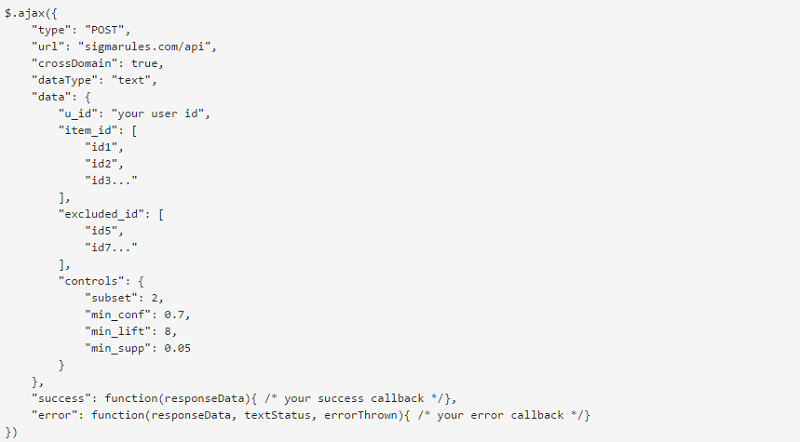 Once the model is built, you can start fetching recommendations via the JSON based web API. Once you created a recommendation engine, you can use it on your eCommerce, by sending an AJAX request every time you need a new recommendation for a set of item ids. The meaning of the individual parameters is explained in this page. It is up to you to implement in your eCommerce the logic for consuming the recommendations. Note: if you need help in this step, don’t hesitate to contact Sigmarules. The service is free of charge as long as you upload a maximum of 250k transactions (for more transactions, you need to ask for a quote). Building a successful eCommerce also passes through understanding the behaviour of your users and recommend them related products, based on their search. Another very important step to complete before that, it’s to build a responsive site, which is functional and with a nice design. Are you running an eCommerce? Are you familiar with customer behaviour and association rules? Nowadays, people like to buy everything online. They prefer sitting at their home and just click and get it to their home. Ecommerce websites have been evolved so much. A few people are building an e-commerce affiliate websites. Building an eCommerce is among my next projects. I’m always looking after diversifying my online portfolio. Glad you liked it, Damien! Great post, well to be honest I’m not into E-commerce and I’m planning to start one small e-commerce site and seems like these tips will be of great help. Good luck with that, Osho. Email marketing is the bedrock of effective eCommerce marketing strategies, because it’s still one of the best methods for influencing our customers and convincing them to buy more. Nothing builds a strong connection with our customers like original content. Tying into our content marketing strategy from above, we have the unique opportunity to choose between unoriginal or original content. Many companies use content pulled from around the web in their eCommerce seo strategies to free up time for other business tasks. An eCommerce marketing plan without A/B testing is sailing blind, so it’s really essential to run tests throughout the entire checkout process. Eventually, thanks for sharing your additional thought with us. Email. marketing really works for several industries. This is the first time that I visited your blog, and truth to be spoken it has a lot to see here, I mean great content and believe me it won’t be the last visit. Actually, I’m just building an e-commerce site for a local client, I learned here some unknown things that will be very useful for me.